Dan MacKinlay is an itinerant (Perth, this month) sound artist and miscellaneous media art event facilitator, online at www.possumpalace.org/user/Dan. Graffiti writers versus public artists. Funding legitimacy versus community legitimacy. The fractious arts community versus itself. Private Commonwealth Games security guards versus the customary streetlight. The very environment makes it hard to ignore that the street art component of Next Wave is on disputed turf, and some of the best works in the program have harnessed contention to their advantage. Taking no prisoners in the battle against saccharine public art is the arresting Clean, championing the city’s homeless people and graffiti artists, both of whom had been made more unwelcome than usual in readiness for the Games. 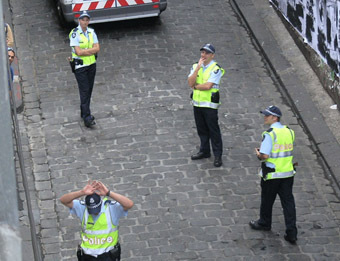 The stencil-art mainstay of Hosier Lane is infested with the ghosts of the repeatedly evicted street dwellers, in the form of sensor-triggered audio recordings. The always cringe-inducing “You don’t have any change, do you?” drops like an epitaph in this little space, as it starkly and suddenly illuminates the mass deportation of the city’s poor. The surveillance state paranoia of officialdom is cheerfully inverted, as Big Issue vendors and drunken teens harangue you from above, in place of the silent police cameras. 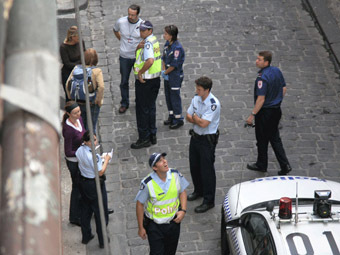 (Hosier Lane in fact sports a blanket and bottle that some hapless sleeper has abandoned, I like to imagine, in their irritated flight from the self-fulfilling prophesies of the sound-art work made to mourn their passing. But anyway.) Under Clean’s umbrella of official art approval, or perhaps just the usual surrender to the cult stencil status of the lane, graffiti here is largely unmolested by council cleanups, densely layered as always, and Clean’s own small street decorations (parodic wallpaper with a repeating council wall-buffing motif) are already vanishing beneath a layer of fresh scrawls. Emile Zile’s New Ruins is placed a little more ambivalently in the public space contention. Graffiti scrawls from the interior of the City Watch House are recontexualised in blue capital letters on an LED display, the sort usually used to announce street detours and miscellaneous public works, on the front of the Watch House itself. Things like “J 4 H 4 EVA” scroll in the firmest of public service announcement fonts across the grim facade. It’s classic detournment, questioning even its own origins in the debates over graffiti as art, just a tad affecting to boot, and it made me laugh until my obligatory Melbourne coffee came out my nose. Zile’s work is in 100 points of light, a night-time program of diverse small scale intervention flavoured works in sundry nooks of the streetscape of Melbourne, in a kind of perturbing nocturnal under-layer to the city’s ascendant Shiny Public Art aesthetic. There are about 30 works at peak periods, though a couple fewer if you are checking immediately after the demolitionary weekend crowds. Brydee Rood’s 3 pieces, Natural Selection 06, have drawn the short evolutionary straw more than once, and it’s hard to find the works in a functional state. Eventually spotting one makes it all worthwhile. Rood has fashioned images of furtive urban scavengers, rats and the like, in LED pictures embedded in wheelie bins. The diodes’ yellow glow transforms dead-end urban crannies into dens for the esoteric process of the wheelie bin life cycle. The effect upon the unbriefed punter, if you’re stumbling on one unawares ducking round the corner for a drunken piss, must be delicious. Which is irritating. You wish you’d just stumbled on this stuff, and that privilege is denied you as you stamp about with a festival program-and-bonus-map clutched in your hand. Half of the pleasure of half of these pieces is the wistful longing not to know what is going on. It’s hard enough to find the things as it is, though. Placements range from prominent, to cunning, all the way to impossible to locate even with a map and description. Emilio Fuscaldo’s Birdie, for example, takes a couple of walk-bys and a double take before you have it nailed. The neon-sign work, perched above the second storey in quantised serenity on a rare space of empty wall on a Chinatown alley, is a transmission of oddity almost invisible against the background neon noise of dumpling joints and wine bars. (“Above the pavement, the sky.”) The buzz of suspecting yourself the only one in a crowded street who has captured this detail... gets me right there. Tim Webster’s Block embeds another neat detail in the landscape outside the Victorian State library. The perforations in the library bins have been transformed into the backlit windows of a miniature skyscraper. It’s toadstool housing for the bourgeois faery-on-the-go. Or perhaps evidence of the fractal self-similarity of the city. Or architectural models for a disposable lifestyle. It’s probably the least sinister piece on display—the cheeky silhouettes on Tim’s tiny windows (mostly domestic, interspersed with occasional spear-bearing hunters and what have you) can sit congruously in the Public Art camp. Or at least, the humour is less indignant than the rest of the series. After a long day’s outrage at the co-option of the urban environment, as strident as the Games city it critiques, in fact, it’s an antidote of comforting, vicarious domestic bliss.